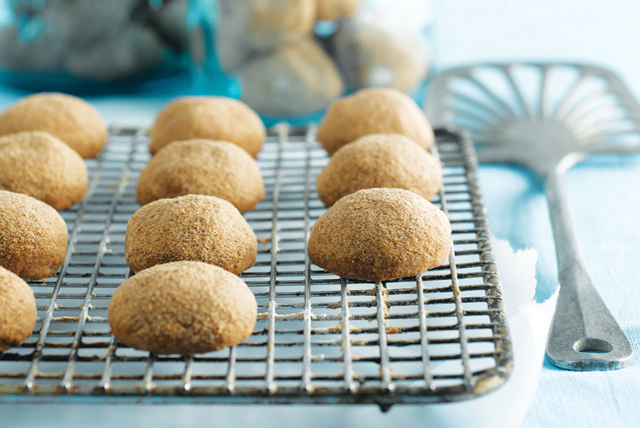 Your family will love this delicious chocolate version of the classic Mexican wedding cookie. Melt 3 oz. chocolate as directed on package; cool to room temperature. Meanwhile, grate remaining chocolate; place in medium bowl. Stir in 1/2 cup sugar. Beat butter and remaining sugar in large bowl with mixer until light and fluffy. Add vanilla and melted chocolate; mix well. Gradually beat in flour until blended. Add nuts and salt; mix well. Shape dough into 1-inch balls. Place, 1-1/2 inches apart, on baking sheets. Bake 12 min. or until bottoms of cookies are lightly browned. Cool 5 min. on baking sheets. Add, 1 at a time, to grated chocolate mixture; toss to evenly coat. Place on wire racks; cool completely. Does grating chocolate grate on your nerves? An easy alternative to make the grated chocolate/icing sugar mixture is to chop the 2 oz. chocolate and add it to a blender or food processor along with the 1/2 cup icing sugar. Use pulsing action to blend 1 min. or until mixture is very fine. Use a blender or food processor to finely chop the pecans. Just be careful not to overprocess them or you'll end up with nut butter!